Download this article as a PDF. Two Pediatric Pulmonologists were at a Conference for Children's Interstitial Lung Disease in 2006. There they learned about a little known form of this disease called NEHI. Only recently had doctors developed the ability to positively diagnose NEHI by Lung Biopsy. These two Pulmonologists had never seen a patient with it. One Pulmonologist lived in Utah and one lived in Missouri. They--and this conference--would eventually be the key to our son's diagnosis. Our story started in November of 2006 when my son Wesley was six months old. It started out as an awful night with my son struggling to breathe. He had caught his sister's cold and basically was up and down all night. I finally got him situated in his car seat and he was able to sleep. Now I realize it was because his head was elevated, and that helped keep his oxygen saturations up enough so that he could sleep. I shudder though, to think how bad his oxygen saturations were that night. It started out as a typical infant RSV (Respiratory Syncytial Virus) story. By the morning I knew I would need to take my son to the doctor and made an appointment for the afternoon. Within an hour I realized he needed to go in NOW. I called up the pediatrician's office and told them I was coming now. They didn't argue. Wesley was puking up his bottles and hadn't kept anything down for 12 hours. He was retracting, gasping, and panting trying to breath. His nose was flaring. When we got there, his pulse ox levels, a measure of the oxygen in his blood, were in the 80s. At bare minimum you must be over 90. After a breathing treatment did nothing, they sent us up to the pediatric hospital. By then his saturation levels were in the 60s. Many infants and toddlers go through this, especially from November to March. They spend a few days in the hospital, recover and are sent home. While Wesley did not test positive for RSV, he did have Parainfluenza, a similar and often nasty virus for babies. It had caused bronchiolitis. We were sent home with him on a tiny bit of oxygen four days later and told to wean him. After he ripped it off one day, he looked good to me and I called him weaned. This event started our new life, living with chILD, Children's Interstitial Lung Disease. We, however, really had no idea yet that there was a problem. A month later, he had another cold, and his illness was a repeat of what had happened the month before. No named virus was found this time. He had just your basic respiratory infection. 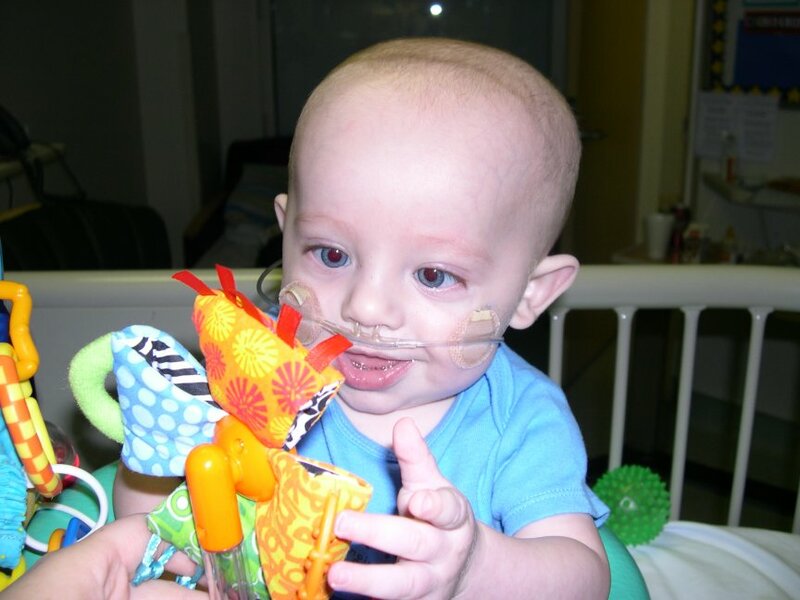 He was sent home on a half liter of oxygen and he was never weaned. Weekly trips produced no possibility of him weaning off the oxygen. He would desat, dropping the level of oxygen in his blood, within minutes of taking off the oxygen. My husband and I basically figured he just had crappy lungs, and maybe the Utah winter inversion air was the culprit. Our pediatrician knew, though, that something wasn't right. There was no reason why he should still be on oxygen that she could explain. She could hear crackles in his lungs but they moved all over the place and after chest X-rays she knew he didn't have pneumonia. She sent us to a pediatric Pulmonologist to get a diagnosis. His symptoms: Tachypnea (fast breathing), retractions, crackles, and hypoxia (low oxygen levels). We saw an excellent Pulmonologist who, because it was the most dreadful part of the winter cold/flu season, wanted to postpone testing and went with the most logical conclusion. She felt he was silently aspirating food or saliva into his lungs. At the same time we were moving out of state, so we trialed medication for a month, did some quick testing and moved to Missouri. Our hope with moving to Missouri was that we would go to a state that was near sea level, and that maybe we would be rid of the oxygen. Within three days of moving, he was admitted to the hospital for dehydration and had bronchiolitis again. There they ruled out aspiration through a bronchoscopy and other testing performed back in Utah. Two days after what was at first glance a normal bronchoscopy, he started running a fever. We took him to the ER even though my husband and I were not in agreement as to even being there. He felt I was overreacting to everything going on and I felt he was in complete denial that something was wrong. I remember walking back from the cafeteria, while my husband was with the kids in the ER praying they would find something so he would believe me. I did not want to hear "I told you so" being said all the way home. Be careful what you pray for. Right before sending us home a wonderful Respiratory Therapist realized Wesley had had a bronchoscopy and looked up his wash results, where they look if any bacteria is in the lungs. Pseudomonas. He had Pseudomonas growing in his lungs. This is very, very bad. At that point they sat us down and told us that Wesley had Cystic Fibrosis. It is extremely common for patients with Cystic Fibrosis to colonize Pseudomonas. However, Wesley passed the sweat test for Cystic Fibrosis, making this diagnosis less likely. The physician then felt it was probably Bronchiolitis Obliterans, a form of Interstitial Lung Disease and a big word that I did not understand. Heck, I couldn't even pronounce it. But they did a CT scan of his lungs, and they knew it wasn't Bronchiolitis Obliterans, though they could see scarring. At that point we were transferred to the local children's hospital for further treatment. At the new hospital, they basically started over with us and returned back to a diagnosis of Cystic Fibrosis. After he passed the sweat test again, saw Genetics, an Allergist, an Immunologist, and Gastroenterologists, they ruled out a wide assortment of diagnoses. They threw out words like ABCA3, Alpha-1 Anti-Trypsin Deficiency, Surfactant Protein Deficiencies and Pulmonary Hemorrhage in Infancy. Another CT scan led our Pulmonoligst to realize what it could be. He called up our previous Pulmonolgist back in Utah and sent her the scan. Could this be the disease that they had learned about at the Conference? They discussed the possibility of this being NEHI and our Pulmonologist called Dr. Leland Fan of Texas Children's Hospital, an expert on NEHI and chILD. He confirmed Wesley's scan had typical NEHI findings including Ground Glass Opacities. Dr. Deterding at Denver Children's, another expert, was also consulted. She said it also was NEHI, but do a lung biopsy, as they have been wrong before. After his first bout with pneumonia and what his pulmonologist called a progression of his lung disease requiring more oxygen, we felt it was best that we go through with the lung biopsy. At 15 months of age, it's abnormal for NEHI to get worse. I had tremendous guilt with the biopsy, hating the fact that he was going to be in pain and scarred because we had to know what we were dealing with. In the end, he did quite well and we got our NEHI diagnosis. Wesley's Lung Scan in August of 2007, his Middle Right Lobe. You can see the damage that NEHI has caused to his lung. Each time you inhale, air travels to your lungs through two major airways called bronchi. Inside your lungs, the bronchi subdivide like the roots of a tree into smaller airways (bronchioles) that finally end in clusters of tiny air sacs (alveoli). Within the walls of the air sacs are small blood vessels (capillaries) where oxygen is added to your blood and carbon dioxide--a waste product of metabolism--is removed. NEHI stands for Neuroendocrine Cell Hyperplasia of Infancy. NEHI is a non-reactive obstructive disease and a form of Interstitial Lung Disease. In NEHI, the small (distal) airways leading into the alveoli are floppy, making it harder to move air in and out of the alveoli. During normal breathing, pressure changes in the lungs allow them to inflate and deflate without much change in the diameter of the distal airways. In NEHI, the pressure changes cause the small airways to get too small or close during exhalation so a child cannot exhale the full lung volume. Some of the old air gets "trapped" in the alveoli, causing the new fresh air on inhalation to mix with the trapped air. There is less oxygen present than normal, which causes lower saturations of oxygen in the blood. The direct cause of NEHI is too many immature neuroendocrine cells in the lungs. A few immature cells is not a problem, but a great number of immature cells are. In most children, symptoms start soon after birth, with rapid breathing, problems eating, and possible desaturations. It usually is much worse at night then in the day since children breathe deeper when they are awake. As children with NEHI get older, the lungs usually grow enough to compensate for the air trapping and most can get off oxygen completely. A smaller percentage present like Wesley, with no problems at first, but symptomatic after a bad respiratory illness, normally RSV, which does the damage to the lungs. Wesley's NEHI was started by Parainfluenza, which is more rare, but probably the second illness after RSV that can trigger NEHI. Researchers are currently tinkering with the thought that NEHI may be genetic, since there are four known cases of siblings getting NEHI. After the consults with the other Pulmonologists, our world would change. Our Pulmonologist came in and discussed with me that they thought it was NEHI. They knew he had Interstitial Lung Disease as that was very evident from the CT scan. I, of course, had no idea what Interstitial Lung Disease was. He then mentioned NEHI, spelling it out for me while I wrote it down. He said unlike the other forms of ILD, NEHI is a good one, because it won't kill him. He won't need a lung transplant. By age five he should be off the oxygen. At that point, I was in your typical Hollywood movie, where everything is in slow motion, as I tried to wrap my head around what the Pulmonologist just said. I cannot explain what it's like to realize that doctors thought my child was going to die or that they thought he had one of group of lung diseases that have horrible outcomes. Speaking with others in the medical field while there, ILD was something that they would shake their heads at, a disease without hope. Looking things up on the internet did nothing but make me more sad. It was a very alone time for me. I mourned that my son had a disease, a disease that would strongly affect his life. There was no easy answer to getting him off the oxygen, which had always been our goal, a naive goal, but a goal. We had moved away from our family and the high altitude of Utah to get him off the oxygen. Now that wasn't going to happen. He had to be on at night, period, and when we tried taking him off during the day, his weight was too affected. Many of the articles I could find on chILD discussed a poor quality of life. I hate that phrase. It makes me so sad. I had joined a reflux parenting board and after Wesley's diagnosis another mom emailed me, stating that her daughter a few years earlier had been given the same diagnosis. And she said, "It will get better." I clung to that hope. With each cold, something that your average child can cope with fairly decently, Wesley gets extremely sick. You live your life trying desperately to keep your child from getting ill. We never went anywhere with him. We kept him away from all other children. But he has an older sister who was more than capable of bring home germs, and childhood illnesses are inevitable. 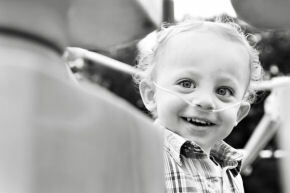 His normal daily life includes dealing with tubing all day, with his respiratory muscles retracting from his neck to his gut and back. His muscles on his trunk move constantly trying to get as much air in as possible. He is a constant state of respiratory distress. If you walked in to the emergency room with your child retracting like my son does, your child would be hospitalized. To us now, it's "normal." He constantly has crackles in his lungs and there is nothing we can do to make them go away. We've been told numerous times that his lungs sound like Velcro being pulled apart. We deal with weight issues, in part because of all that retracting, which causes him to burn way more calories than your average child. Add to that a tummy that doesn't empty very well, which may or may not be part of the ILD, and his vomiting gets out of control, especially when he has a respiratory illness. He gets bronchiolitis each time he gets a cold. If we take off his oxygen when he is ill, he starts coughing nonstop until he vomits and then starts coughing again. One day my sister found a Yahoo Children's Interstitial Lung Disease group. It finally felt like I had hope in mothers who were dealing with the same thing we were. They gave us tons of information, including articles describing NEHI. More importantly, they had children that were doing well. While some of the children over age five, and one teenager, are still on oxygen, we still hope that at some point we will be rid of the oxygen. In the back of our mind, however, we have accepted that he may need it longer or permanently if it makes him feel better. It has been over a year since our diagnosis. I have a laptop full of information now on Children's Interstitial Lung Disease. I have made friends whose children have an ILD diagnosis. Wesley has met a teenage gal, who has ABCA3, and we will be meeting more families at the end of September. I now steer those that I realize could have a similar diagnosis as Wesley to doctors, hospitals and testing that would be appropriate. I've gotten to know parents whose children have died from ILD. It's like a kick to the chest. I don't know if a cure will ever be found, but more treatments have got to become a possibility since currently there is little they can do. My most fulfilling moments come when someone who is newly diagnosed gets on the internet and finds Wesley's blog. They email me desperately trying to find information. I've been there, with no one to help. It makes it worth it, to help one parent not feel so alone with the diagnosis. Wesley is a happy little boy. He is a normal little boy, with crappy lungs. He loves Cars, Toy Story, and balls. He deals with the tubing. Sometimes he's very tired and sometimes he doesn't have the energy to play. Sometimes you'd be surprised there is something wrong when he's doing laps around the house. We try to keep him well but still go to a lot of doctor appointments. He continues to have lots of chest X-rays. He doesn't know any different. Some day I hope he will be an inspiration to others. And some day I hope to tell another mom, "It will get better." Wesley Ince is a rambunctious two-year-old who lives with his parents Garth and Sarah and his two sisters: Corianne, who is six, and Melissa, who is four months old. They live in the Kansas City Metro area. Originally they are from Murray, Utah. Copyright 2008 Complex Child E-Magazine. All Rights Reserved.